You're now ready to download the Birmingham Cross-City South route from this site, along with the Class 323 EMU (developed at the former Trainsimcentral). 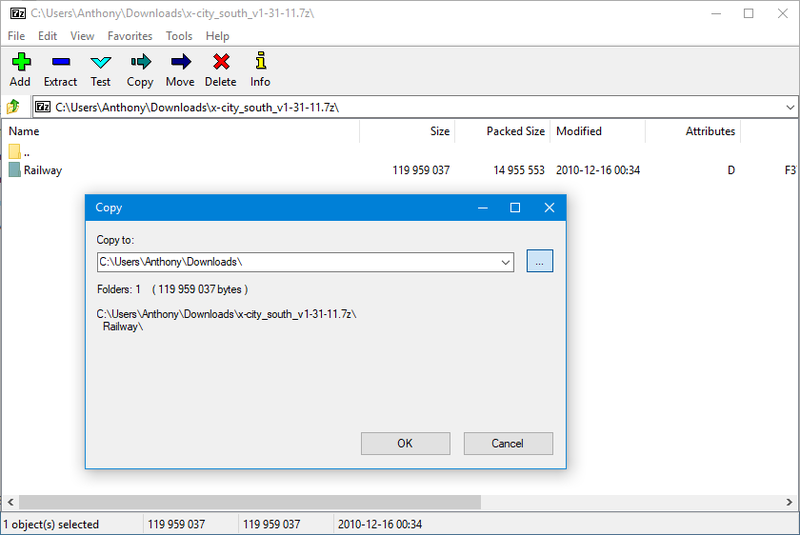 Cross-City South (and many add-ons) are distributed in compressed archives to make the files small enough to be hosted and downloaded. The archives may be in the .zip or .7z formats for example. 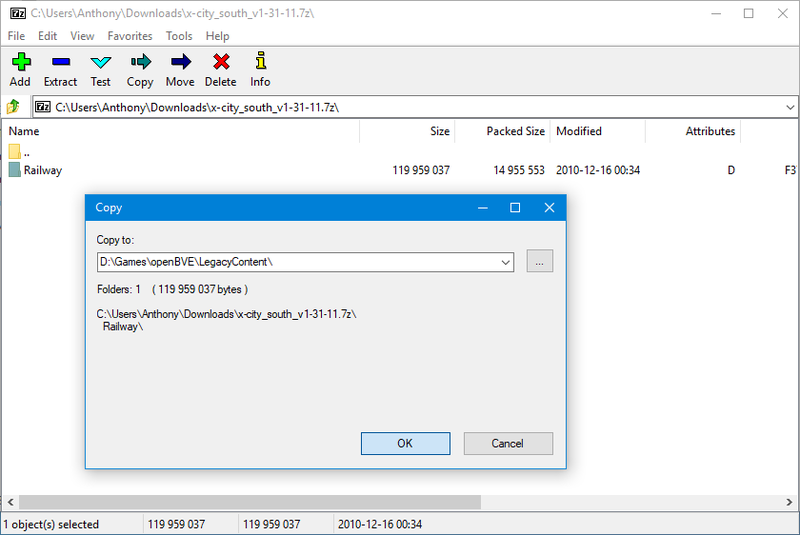 Before you start downloading openBVE content, I'd recommend you first download and install the 7-Zip File Manager. The rest of this guide assumes that you've installed this program. 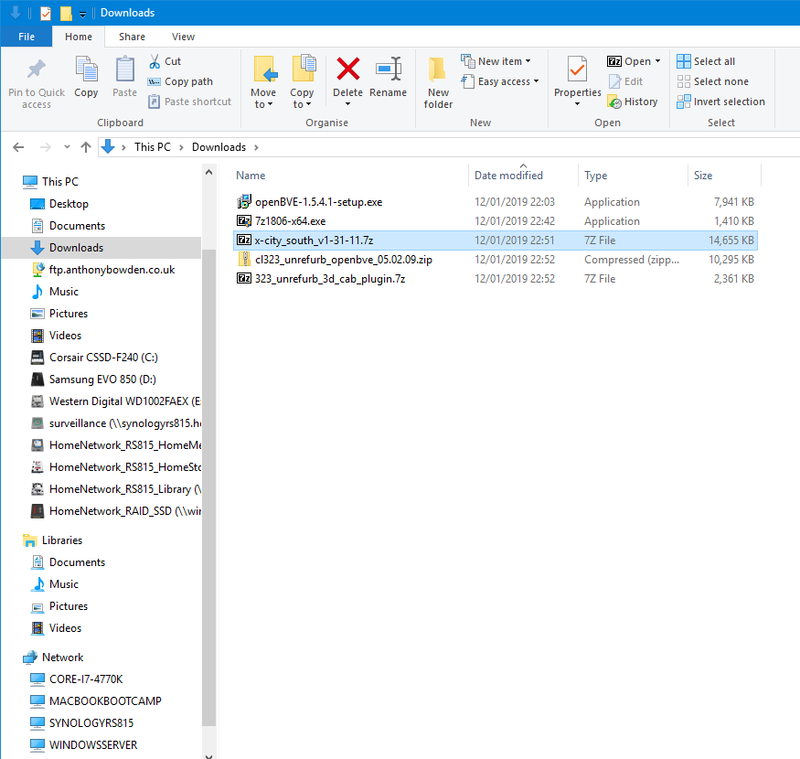 If you've already installed a program like WinZip or WinRAR, you probably don't need to read a fair part of this guide anyway! 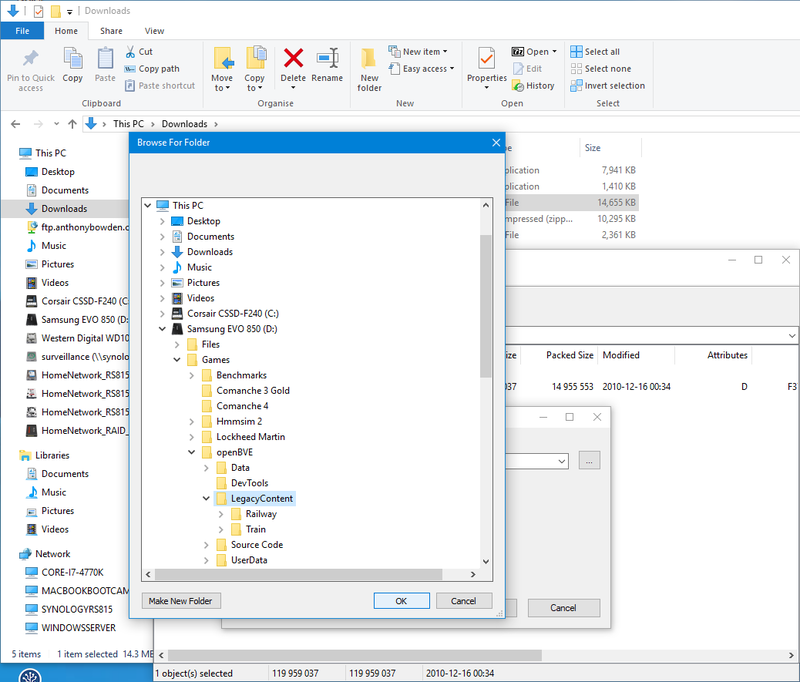 Right-click the Cl323 Unrefurb_openbve.zip icon, open the '7-Zip' submenu, and click 'Open archive'. 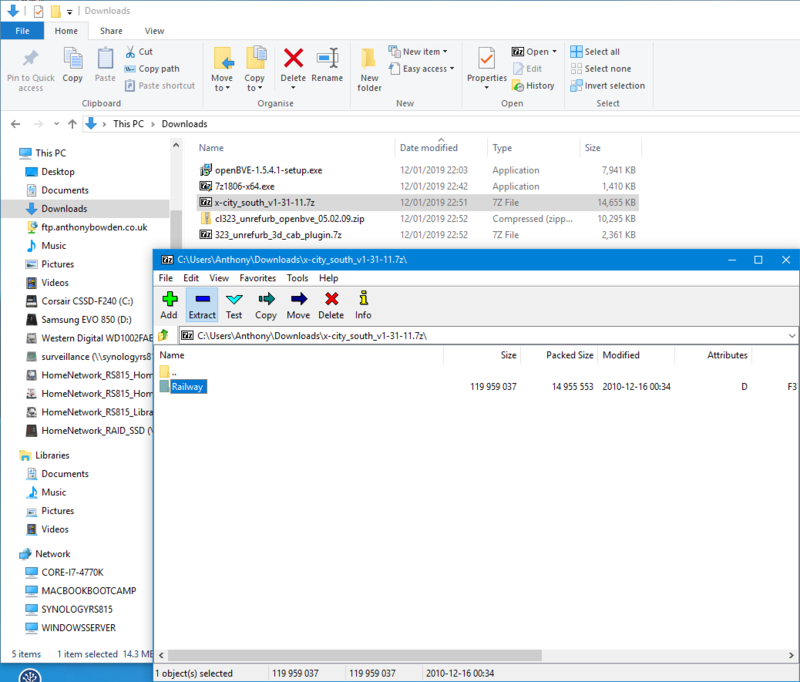 Right-click the 323_unrefurb_3dcab_plugin.7z icon, open the '7-Zip' submenu, and click 'Open archive'. You should be prompted to replace some existing files - click 'Yes to All' to continue. Note: If you're not prompted to replace any existing files, then you've either not installed the base class 323 yet, or you're extracting files to the wrong folder - in either case, please start again with the class 323 installation steps, and follow them in the correct order). 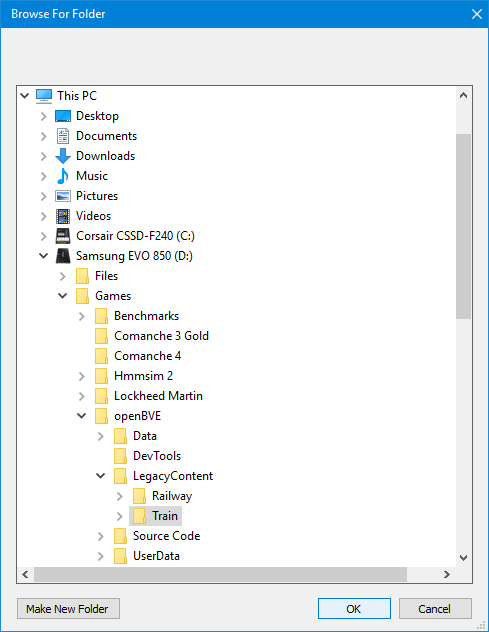 If your folder structure does not exactly match what is shown above (apart from the drive letter and folder in which your 'openBVE' and openBVE 'LegacyContent' folders are located), then you have likely done something wrong - please start over and follow the instructions again. 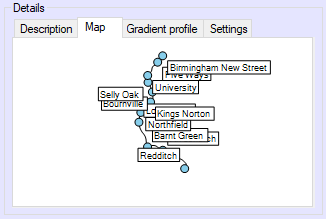 You're now ready to launch the program and load the Birmingham Cross-City South. Double click the openBVE shortcut which you may have chosen to install on your desktop, and you'll be presented with with openBVE 'Start new game' window. Navigate to the location of your openBVE 'LegacyContent' folder which you chose during installation (use the "Up one level" icon if necessary). You'll see the contents of the parent directory. 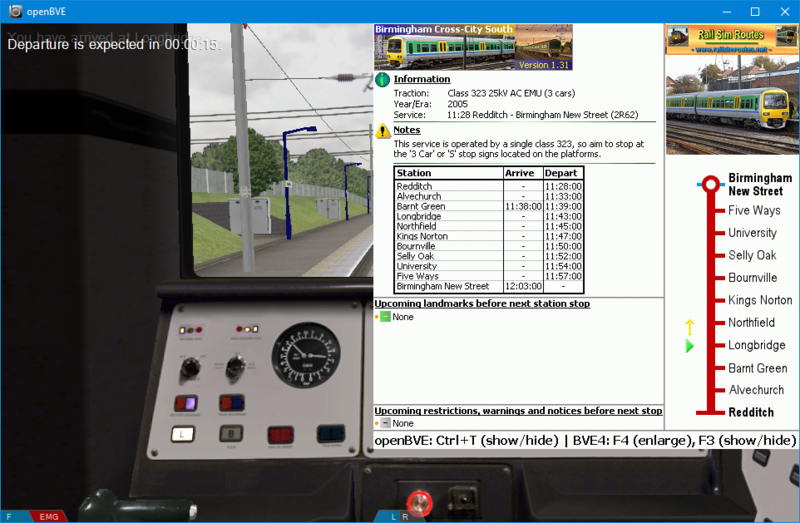 Onve you have found your openBVE LegacyContent folder, double click the folder to open it, and then the 'Railway', 'Route', 'Birmingham_Cross-City_South_openBVE', and 'Day' folders, in turn. 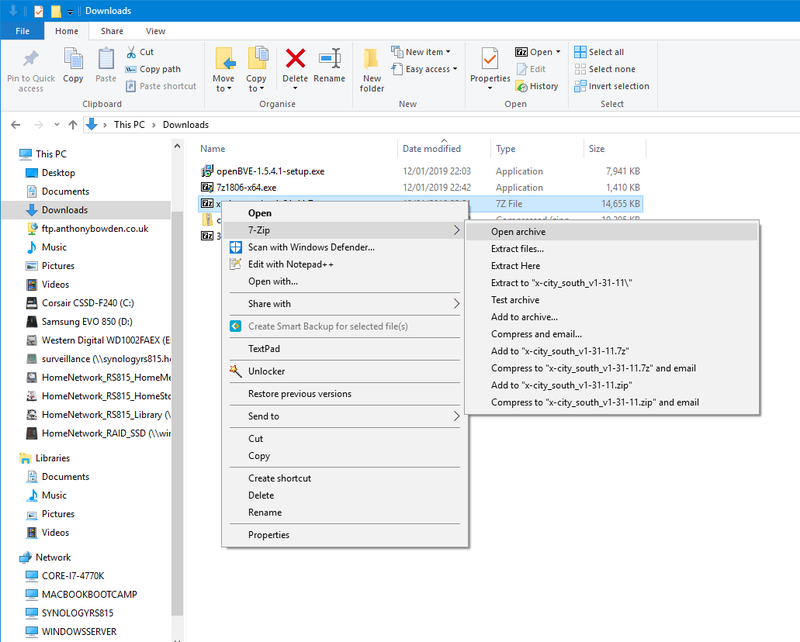 Note: If your 'openBVE' folder and your 'LegacyContent' folder reside on seperate partitions or hard disks, you'll need to manually type in the drive letter where your content is stored, in order to change drives; e.g. 'C:\'. 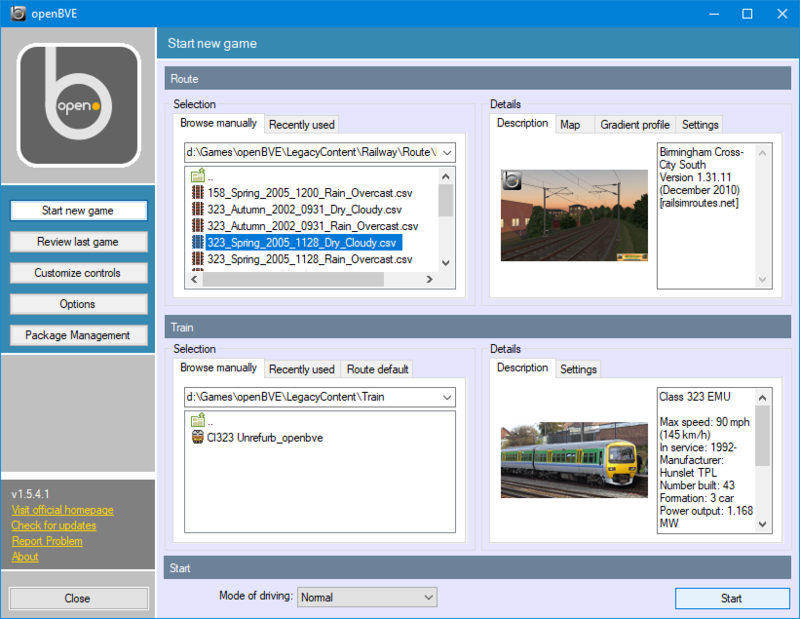 Additional Note: If you click on a route which doesn't also have it's default train installed, then you may see an error in the Train section, stating that a train this route uses, cannot be found. If this happens, then in the Train section of the form, click the Browse tab if necessary, and repeat the process you went through to locate a route file before, but this time, select the 'LegacyContent' folder, then the 'Train' folder instead. You'll see available trains listed here. Single click on a train you wish to drive. 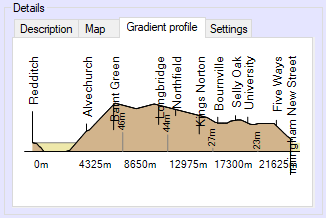 There is a "Mode of driving" drop-down box at the bottom of the screen, in the Start section. Here, you can select between Arcade, Normal or Expert modes. Each mode offers differing levels of on-screen assistance and information, and for most users, I'd recommend the Normal mode be chosen, and the driving tutorial on this website assumes 'Normal' mode is enabled. You can now choose to start openBVE by clicking the Start button at the bottom right of openBVE's window , and the openBVE loading window will appear. After a few seconds, you should find yourself sitting in the cab of the class 323 EMU, waiting for departure at Redditch... If you don't know what to do now, please read on. 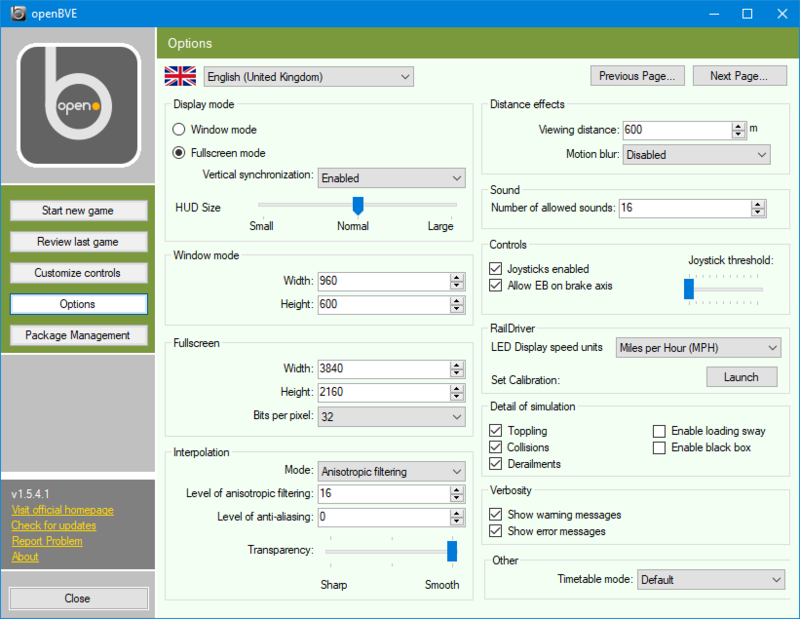 Note: Some interface elements are only shown in certain driving modes, known as Arcade, Normal, and Expert. 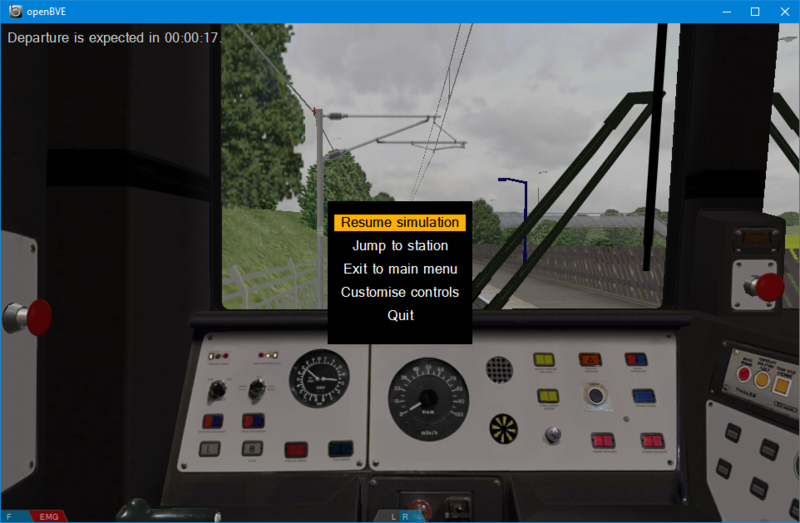 Here, you can jump to other stations en-route, exit the current game and return to the main menu to load another route and train, or quit openBVE. To choose a menu item , either point and click, or use the 'Up' and 'Down Arrow' keys. To select an option, press the 'Enter' key. To go back up a level in the menu hierarchy, press the 'Escape' key. Lastly, if you have a stuttering or pausing problem which you can't resolve, as a last resort, please tick the Disable OpenGL display lists checkbox via openBVE's Options page; this might help. Setting it to true may yield more consistent, but possibly significantly lower, framerates.